Artistic ‘outdoor living room’ coming to San Marco - The Resident Community News Group, Inc. | The Resident Community News Group, Inc. Colorful umbrellas and original artwork could make the Union Hall complex San Marco’s new arts district. Down by the train tracks on Hendricks Avenue, near historic South Jacksonville City Hall, Tiffany Ash wants to create a sort of “artistic outdoor living room,” on property that includes two of the neighborhood’s historic landmarks, San Marco Train Station and Union Hall. Ash, who is business manager for AshCo, a family-owned design and development firm located at 1432-1 Hendricks Avenue and owned by the Ashurian family of San Marco, is planning to renovate two formerly nondescript buildings – 3,000-square-foot Union Hall and a 900-square-foot adjacent structure, both located at 1457 Naldo Avenue – with the same kind of artistic whimsy her firm created when it restored its neighboring property at 1431 Hendricks Avenue. 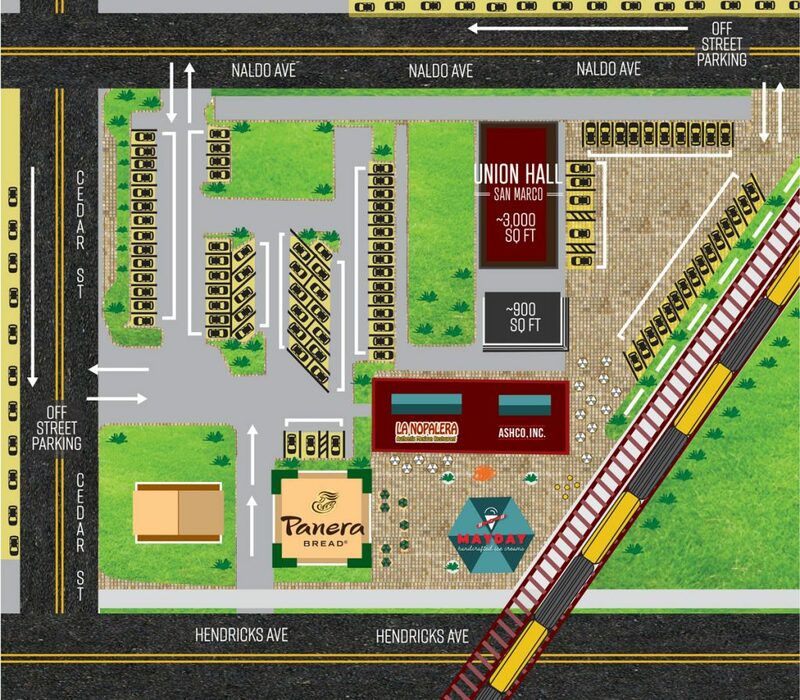 Rendering of the new San Marco Train Station/Union Hall complex being designed and developed by AshCo Inc. The two-parcel complex, with each parcel owned by a separate entity – San Marco Train Station LLC (1431 Hendricks) and Union Hall LLC (1435 Naldo) – will be designed to “flow” into one another as one complete concept, Ash said. “We’re working with the owners of both properties. They’ve been very cooperative. The concept will fuse modern design with the history of San Marco,” she said. “Our vision has always been to create a fun lifestyle center where people can come and hang out, sit outside, enjoy an ice cream, have lunch, or take a break and just have a good time,” she continued. Union Hall appears to have a rich “union” history, according the City of Jacksonville property appraiser’s website. Prior to its purchase for $410,000 by San Marco Union Hall LLC in November 2017, Union Hall, an undistinguished, one-story building, had been owned by Sheet Metal Workers Local 435 Land Company, Inc., and earlier by Operative Plasterers and Cement Masons Local 401. AshCo’s plans to refurbish the building include having a splashy mural painted on its exterior façade, and possibly extending the height of the building, although keeping it at one story. Ash noted her firm is working with several restaurant groups and the property already has city approval to seat 122 patrons. “We are also working with several boutique-style health clubs. That would be great because the people of San Marco are a more educated, health-conscious group,” she said. Parking should be no problem for the new development. Included in the Union Hall plan is a lot with 60 parking spaces, she said. Also, on the Naldo Street property will be a food truck, decorated with a mural, and several benches made of large trailer treads, similar those in Wynwood. A small airplane, which will be restored, will fly on a pedestal 12-16 feet in the air outside the “grab-n-go” restaurant. 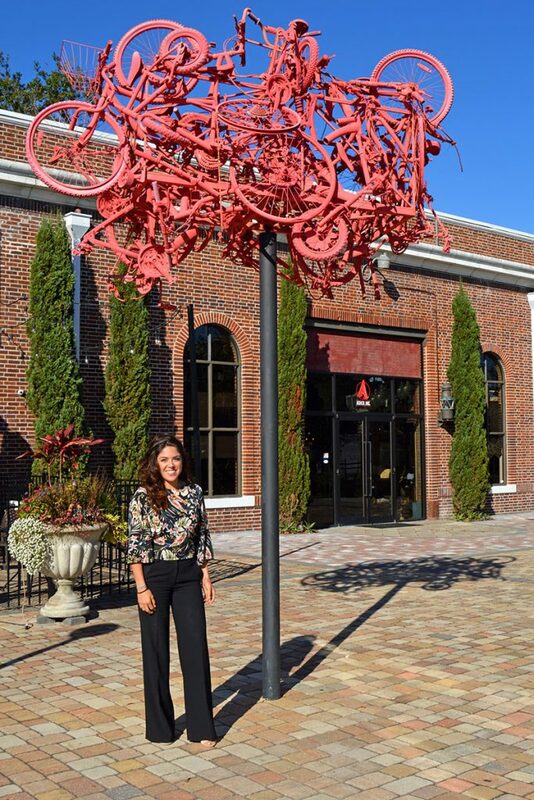 Tiffany Ash, business manager of the design and development firm AshCo, stands beside a whimsical sculpture designed by her sister, Nicole Ash, who also works for AshCo. To add to the location’s fancy, the plan will also include a display of floating umbrellas similar to the colorful sunshades that rise above Yoel Moshe Solomon Street in the historic district of downtown Jerusalem or in South America. “There is nothing like this in Jacksonville right now,” Ash explained, noting the theme of the development is innovation, technology, and transportation. “There will be cut-outs with stools, where you can sit outside. We will have a venue for artists if they want to have a band to play outside. We have already spoken with several studios who want to do their performances here,” she said, adding that Shawn Pfaffman of First Coast School of Music in San Marco has expressed an interest in holding outdoor concerts on the property. In 2016, AshCo put its artistic mark on the complex with a development located at 1431 Hendricks Avenue, which was deemed to be a convergence of the past, present and future. Encompassing the past, it converted the 110-year-old JEA Utility Building, known as both the Waterworks Building or San Marco Train Station. The building was never owned by a railroad but named as a train station due to its proximity to the railroad tracks. AshCo transformed the building into its corporate offices and La Nopalera, a large eatery. The development’s take on the present is represented by Panera Bread, a 4,000-square-foot restaurant, developed by AshCo in 2013, that sits next door to historic South Jacksonville City Hall. The future is represented through an octagonal glass building, which is currently home to an ice cream store. Ash said her company expects to complete the Union Hall expansion in the first quarter of 2019, possibly opening as early as April 1. “We are very excited about not only the preservation aspect, but where San Marco is going. This is going to be a big part of that,” she said.